This is the new craze among people “too old” for stuffed animals. I’m not gonna lie….I sleep with a teddy bear. There. I said it. And I’m proud. It’s not because I can’t sleep without it and it’s not because I need comfort, I just really like having somewhere for my arms to be. If you are too embarrassed to celebrate ol’ Teddy Roosevelt yourself, you can get what a special certain someone I know has. You know those squish pillows that were super popular a few years ago? Well we have a couple that have a super soft Brookstone cover. If you know the fabric I’m talking about, you know how phenomenal they are. 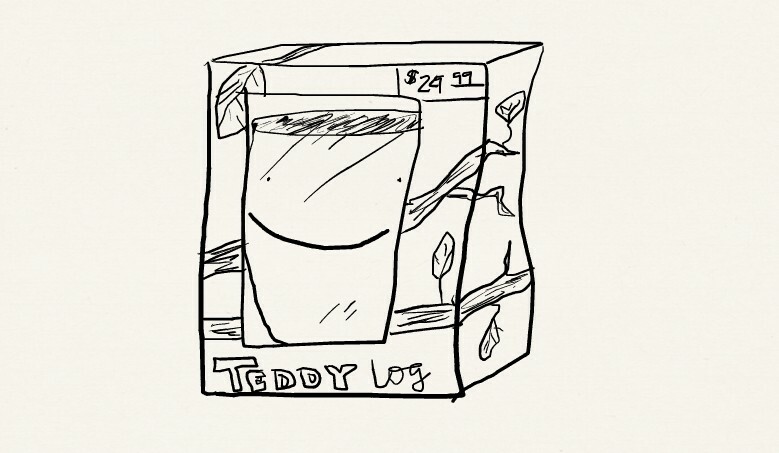 I decided that this certain special someone likes sleeping with it because it’s a Teddy Log, versus a Teddy Bear. It’s not really a pillow but a stuffed animal in disguise. So all you adults out there too afraid to admit you like something to cuddle up with when you sleep, get yourself one of these “pillows” and know that you are enjoying a sweet night’s sleep with your very own teddy log. Duncan is out of the office. No such thing as too old for a teddy bear.